I was searching this morning for an image of a toolbox or a playbox to sum up how I think about Web 2.0. I found this one on one of my favourite Web 2.0 sites Flickr and via a Creative Commons search. 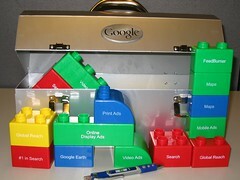 The toolbox is branded Google, but of course Google is one part of the whole Web 2.0 world. I think you’ll get the idea. Web 2.0 is a great big toolbox of opportunity. It’s important that we try out the tools, find the one that works for us, and share it with others. And enjoy along the way! Check out how others feel about Web 2.0 on the Bamboo Project blog.